Our extensive production knowledge sets us apart. Think of us as your project managers. Once all of the parameters of your job have been defined – you’re done! You can relax knowing that we will handle all follow up to insure accuracy and on time delivery. Should it become necessary to involve you prior to completion – we will reach out in a timely manner to keep your project on track. We know you’re busy. Babysitting your vendors shouldn’t have to be part of your to do list. With 1525, it won’t be! A screen printer will sell you screen printing!! Vector artwork is digitally created with shapes, lines, curves, or paths that can be easily colored, manipulated, and resized without affecting the quality of the image. Raster Artwork is digitally created using pixels. Quality of a raster image can be negatively affected by being re-colored, manipulated and/or resized. Please convert all fonts to outlines or curves before submitting artwork. Note that script fonts will also need to be welded. If color changes are needed, please provide PANTONE colors, or CMYK values. Please submit raster art for reference with vector art files. This allows us to be certain that your vector file has opened correctly. Please note: Due to limitations in four color process printing, color matching is not always 100% attainable when creating the final product.Please provide artwork with a resolution of at least 300 dpi at actual size. This can vary with the actual process so if unsure, please call to confirm. Avoid using images from the internet as most are too low a resolution for a quality imprint. 1525 has a full service art department. Artwork is billed at $50.00 per hour and is quoted on a project basis. Many of our customers still aren’t completely familiar with what screen printing is and how it works. Let’s clear that up right now! Basics of the manual screen printing process: A. Ink. B. Squeegee. C. Image. D. Photo-emulsion. E. Screen. F. Printed image. Screen printing is a printing process that dates back to 960 AD. It uses a woven mesh (silk in earlier times and polyester in modern times) stretched around a wooden or metal frame to support an ink blocking stencil.Technology has come a long way in terms of stenciling method and today a light sensitive emulsion is used. Screens are first coated with this emulsion and allowed to dry. A clear film with black in any area ink should print, is placed on the screen. This is hit with a strong light source causing the clear areas to harden, and the areas under the black to stay soft. The screen is then sprayed with water, washing away the areas where the ink should go through the screen. Each screen prints one color. You may notice with earlier examples of screen printing that images tend to be large blocks of color. With all of the graphics technology developed over the last 30 years, we can now use complex dot patterns to achieve photographic quality – that’s how detailed this process can be! The screen printing process is used on fine art, t-shirts and other apparel, and many promotional products. It’s a popular process because of the vibrant colors it can produce.In terms of fine art, many of you may be familiar with the Andy WarholCampbell Soup Can series, or the Marilyn Monroe prints. In the world of fine art, the process is known as Serigraphy. 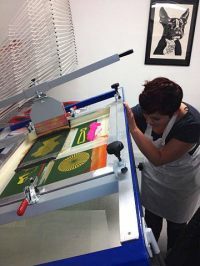 While more industrial applications of screen printing typically involve one to six colors, serigraphy may include twenty to fifty screens/colors for an art piece. We’ve watched the industrial screen printing process evolve over the last 30 years. As was mentioned earlier, vastly improved graphics capability is probably the biggest reason for this. Computer graphics in general have revolutionized the process by allowing for exact line to line color separations. This means no overlap – unless it’s needed. Because t-shirts can be printed wet on wet, and cured after all of the colors have been applied, this allows for a much cleaner and higher quality print. Four color process separations (or CMYK) printing allows for the fine detail associated with a photo images. Those designs are also printed wet on wet, but with a transparent ink that allows the colors to blend. Another game changer has been the types of ink available. The quality of inks has improved and the choices in specialty inks have increased. For example, glitter or shimmer inks, which incorporate metal flakes, create a sparkle effect. Metallic inks are similar but use a smaller flake, making it more conducive to detailed images. Puff ink expands in the drying process giving a raised 3D effect. Suede ink contains an additive that gives the dried ink a suede look and feel. There are additives that allow for printing on nylon, and stretchy fabrics. The most common t-shirt inks are plastic based and as with most inks, require heat for the image to cure. Is your artwork conducive to your substrate? If your design is very detailed, it will print better on a smooth T-shirt than a course canvas tote bag. Is your artwork conducive to the inks you’d like to use? Glitter and shimmer inks need to print through a course screen mesh size. Detailed art needs to print through a finer mesh. Will your artwork work on different garment styles? If practical, this is advantageous for pricing. Our quantity price breaks are based on the screen set up. So if you have 24 t-shirts, 30 crewneck sweatshirts, and 18 hooded sweatshirts – all getting the same size logo – they can be combined to get to our 72-piece price break. 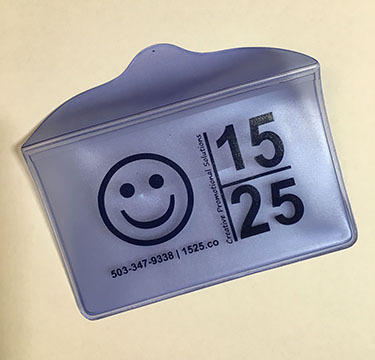 On a promotional product, such as a pen, what is the image area size? Sometimes you may have to make minor modifications to insure that text is legible on smaller items. 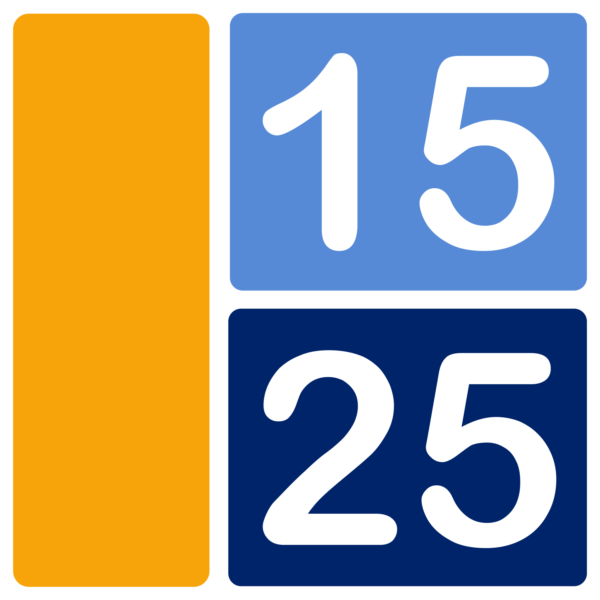 At 1525, we have extensive screen printing knowledge having owned and operated large, high volume, production facilities in the past. It’s part of our job to take all of these variables into consideration to maximize the quality and cost effectiveness of your projects. Many of our customers still aren’t completely familiar with how embroidery works. Here’s the scoop! As with screen printing, embroidery is a process that’s very old, dating back to the fifth through third centuries BC in China. For many centuries, the embroidery process and techniques went virtually unchanged. There was a substrate (the fabric), and needle, and thread or yarn. In addition to this, other materials, such as beads, pearls, sequins, were also incorporated into designs. Although there really isn’t much difference between the end result of embroidery now and embroidery from centuries past – the process has changed significantly in recent times. Beginning in the mid-19th century, the process became “industrialized”. A combination of machine and operator created the ability for mass production. By the mid-twentieth century, machines became much larger with more heads, and faster sewing time. Depending on some of the variables, today sew times can range from 400 to 1500 stitches per minute! 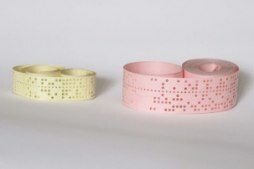 Prior to the digital age, embroidery machines were programmed with a punch tape. The sequence of punched holes was fed through a reader, giving the machine instructions regarding the design such as needle movement, stitch type, stitch length, and thread changes. All in all, it’s quite an amazing feat. The digital age brought the preparation of sew files to a whole new level. Imagine working on the computer and seeing an enlarged version of the image complete with stitch types, and the ability to see how it will sew from start to finish. Maybe an area should have a fill stitch instead of a satin stitch. These changes are much easier to make in the digital age. The ultimate test is still producing the first sew out, but even then, editing is easy – clicking on a sew file is much less cumbersome than cutting and taping together a punch tape, and then reloading it into the reader. There are different brands and styles of embroidery machines, but the general concept is the same for all of them. An operator is needed to hoop the items to be embroidered, load and unload the machine, and ensure things are running smoothly. 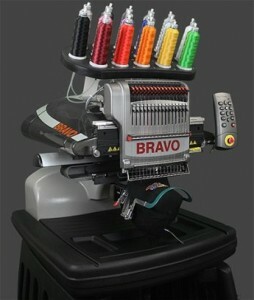 Machines hold many colors of thread at once allowing a design to be sewn from start to finish without stopping. Once the design has completed sewing and the item is removed from the machine, some finishing work may be needed. Is your artwork conducive to the process? Sometimes it’s necessary to make slight modifications to detailed designs to achieve the end result desired. This is especially true for very small lettering, or fine detail. Can the item you wish to have embroidered be hooped properly? We can answer that for you. Also, many of our vendors offer items that have been modified specifically for embroidery. For example – jackets with an embroidery access that allows hooping through the top layer of fabric, but not the lining. Pricing – while screen print pricing is based on the number of colors/screen set ups per design, embroidery pricing is based on the number of stitches. So a 6000 stitch design is the same price whether it has one thread color or six. Reorders – embroidered orders can be more cost effective to reorder, particularly a multicolor design because there are no reset up charges to amortize over a small quantity. At 1525, we have extensive embroidery knowledge, having owned and operated production facilities in the past. It’s part of our job to take all of these variables into consideration to maximize the quality and cost effectiveness of your projects. Again, give us a call and tell us about your project. We’d love to assist you with finding exactly what you need at an affordable price! There are three types of transfers that we work with on a regular basis. The one thing that they have in common is that they are all applied to fabrics using heat and pressure. You might think of “iron on” – but with the use of industrial heat presses, the process is much more precise. Vinyl transfer material comes in a roll or sheet form. It has an adhesive backing, so that when it is cut, it can be weeded and then placed on a garment for application. Artwork is generated on a computer, converted to a cutting file, and the material is cut using a plotter fitted with a blade. Probably one of the more common uses for vinyl is for sports team uniform decoration. This is a common method for numbering and also adding individual player names. Conducive to quick turn around. There is no set up as with screen printing. Once vinyl is applied, the item applied to is ready to wear or use. A good option for simple designs – especially one color – in small quantity. Maybe you need 5 shirts with the word staff on the back. This would be a very cost effective decorating option. Many types of vinyl are available. Whether adding transfers to a thin T-Shirt, a stretchy performance fabric jersey, or a heavy nylon jacket – there are many choices. We can even get 3M Reflective vinyl! Not suitable for complex designs. Not only must the material be cut with a blade, but it must also be weeded cleanly. Limited color selection. Compared with screen printing which offers virtually an unlimited ink color selection, vinyl is limited to the colors that are manufactured in each variety. Not cost effective for large orders. With the exception of team uniform decorating, vinyl transfers will not be as cost effective as screen printing in large runs. Digital transfers allow for complex color images by digitally printing vinyl transfer material. As with the solid color vinyl, there are many varieties to accommodate different fabric types. Although complex designs are possible, there is a need for a border to allow for the cutting. In the example below, we added a white border to the image to allow for the cutting, and the fabric it was applied to was also white. The visual effect of this was very clean. Allows for detailed multicolor design – with the exception of designs where adding borders hurts the integrity of the image. Many types of material are available. Whether adding transfers to a thin T-Shirt, a stretchy performance fabric jersey, or a heavy nylon jacket – there are many choices. Won’t work for all complex designs. The design needs borders for cutting. Not cost effective for large orders. Screen printing becomes a more cost effective option with larger runs. The set up charge amortized over the quantity does not add significantly to the unit price. There are a few scenarios when it makes sense to screen print onto transfer paper, as opposed to screen printing directly on the garment. In the example below, the variable was cost. Our customer had many different styles of garments, two logo designs, multiple color combinations, and multiple logo sizes. Set up and run charges would have been steep. Screen printed transfers allowed us to create a gang sheet of images making sure we got enough of each combination to complete the order. 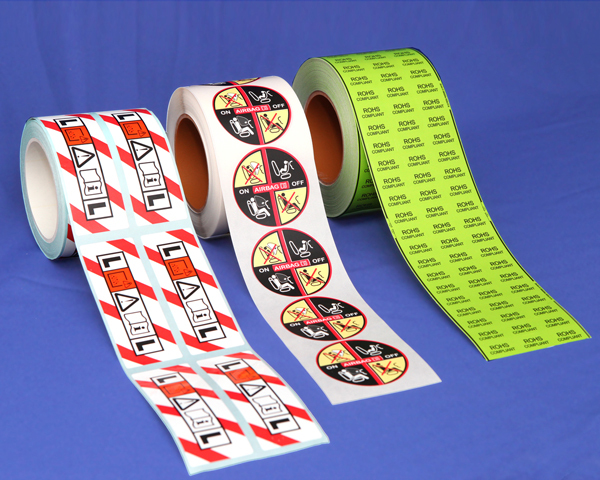 Screen printed transfers have also been utilized in Company Web Stores. In this manner, garments can be decorated as needed as opposed to trying to carry stock, or risk having to produce small screen printed runs. Allows for a variety of image combinations. With the example above, billing was based on one – three color design. We in fact have 5 different variations of the logo. Practical for order fulfillment scenarios – Stocking heat transfers is much easier and cheaper than pre-producing items in the hopes that they sell later. This creates a multi-step process. If you’re ordering 400 t-shirts and you need them all, it makes sense to print directly onto the garment. 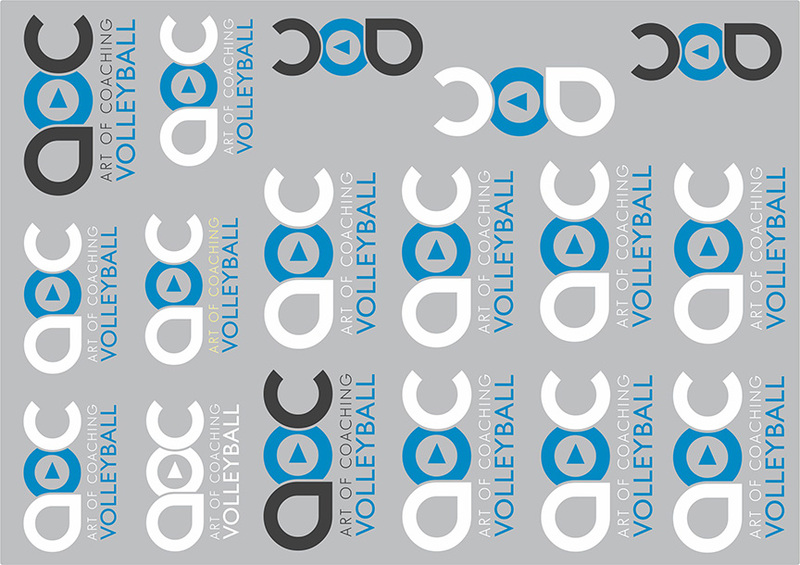 It will be faster and more cost effective than producing the same order with screen printed heat transfers. So many options!! And we’re here to help you make the best choices for your needs. Sublimation is a chemical process where a solid turns into a gas without going through a liquid stage. Dye Sublimation is the method of applying an image to specially coated ceramics, metals, and polyester cloth, using three main ingredients: sublimation ink, heat and pressure. When the heat and pressure are applied, the dye on the transfer medium sublimates, or becomes a gas, and is then absorbed into the polyester itself; the print is actually a part of the garment/coating. It doesn’t fade easily, wear, or have any texture or weight. Some of the more popular products that we decorate using the sublimation process are table cloths, blankets, towels, roll up banners, as well as apparel. 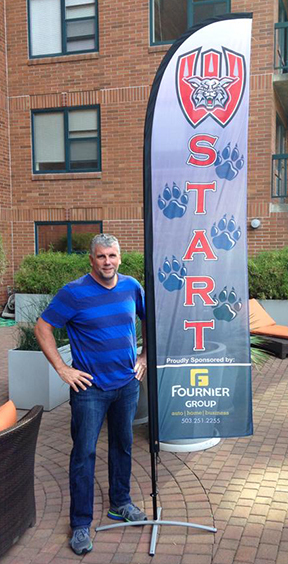 The photo here shows one of seven custom banners that were produced for a cross country team. Full color on small runs. Unlike screen printing, there is no need for separate screens, films, or a great deal of setup for sublimation. Once your artwork has been set up correctly, the process is pretty straightforward. On smaller orders, it can be less expensive overall than screen printing. Individual customization. Though art charges may apply for customization, since each garment is printed from it’s own transfer, this method makes it much easier to add individual customization to each printed item. Softer Touch. The nature of sublimation means that prints are never heavy or thick. The garment is unchanged by the process, except for the addition of your art. Durability. There is no cracking or peeling in a sublimated print. It will last as long as the substrate it is applied to. White or Light garments only. Sublimated images blend with the color on which they are printed, so the best result comes from printing on white garments. However; although it is more expensive, you can choose to print the whole garment! This means that not only could you turn your white garment any color, you could also cover it’s surface with any image you like! Polyester garments only. This isn’t as much of a restriction as it used to be with the large selection of performance fabric garments. The largest amount of modern performance fabrics andmoisture-wicking fabrics, are made of polyester. Even cotton-like textured garments are being made in sublimation-friendly polyester! Garment decoration has come a long way baby! And this is just another option in our arsenal of decorating options for you! Direct to garment printing, also known as DTG printing, is pretty much what it sounds like. 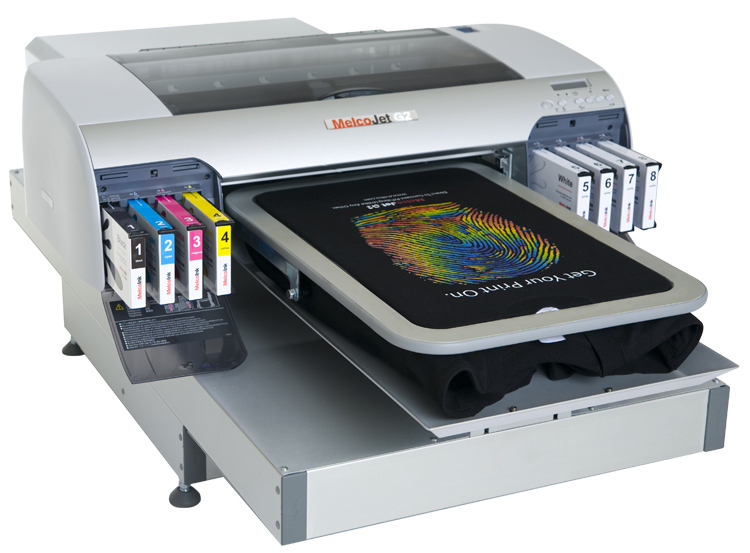 Think of a large inkjet printer – printing directly onto garments. The two components that are required to make the magic happen in this printing application is a transport mechanism for the garment, and specialty inkjet textile inks. Unlike screen printing, where the ink is driven through a screen into the garment with a squeegee, the inks are applied directly to the garment and absorbed by the fibers. Technology has improved and there is now the capability to print in this manner onto dark garments. However, this technology is not quite as readily available. Systems meant for white or light colored 100% cotton garments are much common. Cost Savings for small runs of multicolor designs: With traditional screen printing, there is a screen set up for every ink color used. And in the case of a four color process design, there can still be the need for spot colors. This can be a costly expense when amortized over a small quantity. Fast Turn Around: Because there is no set up charge – DTG is conducive for quick turn requirements. Print Speed: Direct printing can take several minutes per shirt, whereas an automatic t-shirt press can print 8-12 shirts per minute! Large quantities should be screen printed. Diminished savings for one and two color designs: With digital printing, the pricing variable is image area. Screen printing prices are based on number of colors. 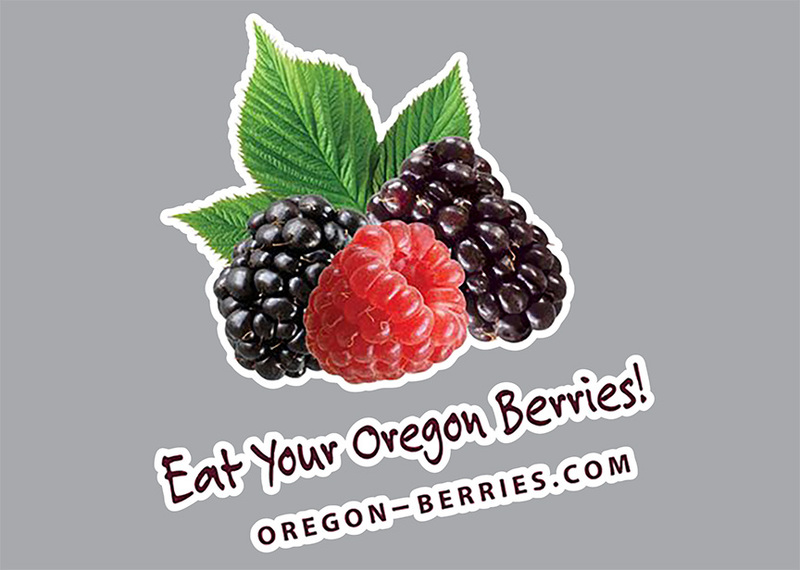 In the case of a large image that is only one or two colors, it will probably be more cost effective to screen print. Flexography is a process frequently used for printing on plastic, foil, acetate film, brown paper, and other materials used in packaging. It uses flexible printing plates made of rubber or plastic. The inked plates with a slightly raised image are rotated on a cylinder which transfers the image to the substrate. Flexography uses fast-drying inks, is a high-speed print process, can print on many types of absorbent and non-absorbent materials, and can print continuous patterns (such as for giftwrap and wallpaper). We’ll help you to determine the right process for your project! What the Heck is Hot Stamping?? In the 19th century, hot stamping became a popular method of applying gold tooling or embossing in book printing. Originally used on leather and paper, the method became a popular means of marking plastic from the 1950s on. It is also one of the most commonly used methods of security printing – you know, the shiny images on your checks. Among the commonly used tools in hot stamping are dies and foil. Dies may be made of metal or silicone rubber, and they may be shaped directly or cast. They can carry high levels of detail to be transferred to the surface and may be shaped to accommodate irregularities in the surface. 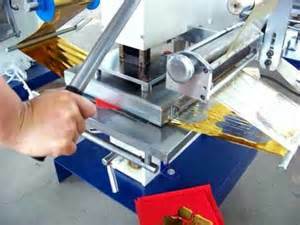 Foils are multilayered coatings that transfer to the surface of the product. 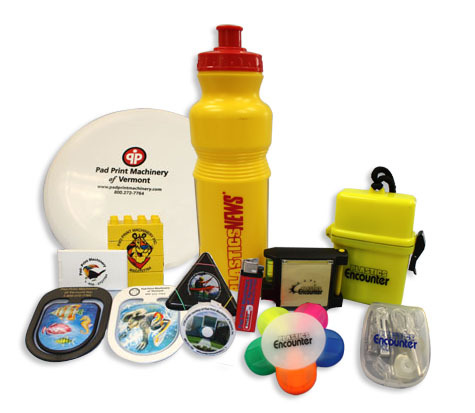 Non-metallic foils consist of an adherence base, a color layer, and a release layer. Metallic foils replace the color layer with a layer of chrome or vacuum-metallized aluminum. Metallic foil construction has a metal-like sheen and is available in different metal shades such as gold, silver, bronze, and copper. Pigment foil does not have a metallic sheen but may be glossy or matte. Holographic foil paper includes a 3-dimensional image to provide a distinctive appearance to specific areas of a digitally printed application. Different hot stamping machines serve different purposes, but the most common hot stamping machines are simple up-and-down presses. Cool Foil Options. Material used in the hot stamp process includes shiny foils, as well as foils with patterns. Of course it depends on the vendor as to availability, but this can be a nifty option for a different look. Clean Room Safe Process. Should the need ever arise, hot stamping is a dry printing process which does not involve solvents or require drying. 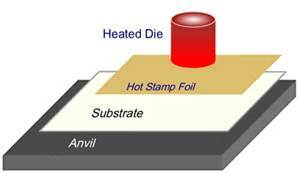 Because of this, hot stamping is the only printing process that can be used in a clean room. Safe on Plastic Items. An item such as this business card holder could be screen printed but would then have to air dry – very problematic in mass production. Color selection. Although there are some very different options available with hot stamp films, color selection is limited to whatever a particular vendor is offering. It’s good to know that this is yet another decorating option! Have you ever lost sleep at night wondering how golf balls are printed? Well your sleepless nights are over!! Here’s a nifty visual, and then we’ll talk about it a bit. Open Ink Well System. The example above shows an open ink well system – an older method. It uses an ink trough for the ink supply, located behind the printing plate. A flood bar pushes a pool of ink over the plate, and a doctor blade removes the ink from the plate surface, leaving ink on the etched artwork area ready for the pad to pick up. Sealed Ink Cup System. In a sealed cup system, a sealed container acts as the ink supply, flood bar, and doctor blade all at the same time. A ceramic ring with a polished working edge creates the seal against the printing plate. Printing Pads are usually molded from silicone rubber. They’ll vary in shape and size depending on what is being printed. 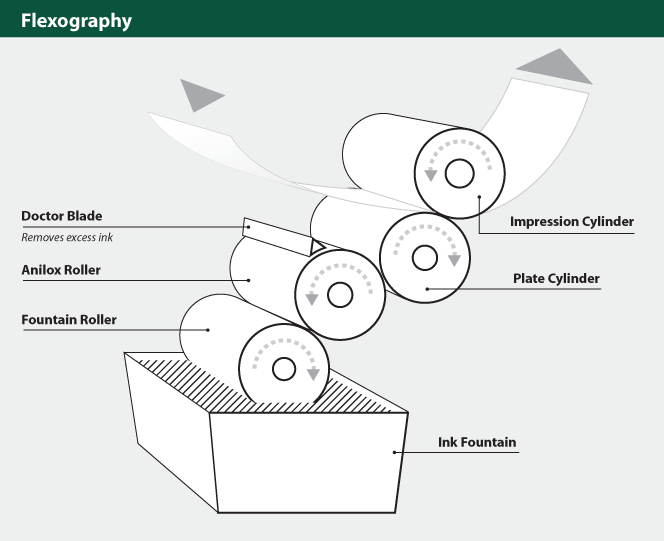 The pad picks up ink from the Image plate and transfers it to the product being printed. Artwork is etched onto the Image Plate. The purpose of this is to create a cavity to hold the ink that the printing pad will pick up. Pad printing inks are solvent based. They may seem dry within seconds of printing but need a longer time to fully cure. UV inks require UV lighting to fully cure. This may be as quickly as a one second exposure, or longer depending on the ink, substrate, and light power and spectrum. As you can see from the above image, MANY things are pad printed. If the item is cylindrical, spherical, concave, convex, textured, or made up of compound angles – pad printing is the decorating answer. We hope this brings clarity to the process! Over 60 years combined industry experience, AND – a burning desire to learn. We want to know about the latest products and processes that our industry has to offer! We can troubleshoot at the front end of your project. Our understanding of the parameters of each process, helps to expedite your order. Virtually no time lost engineering your project. We add another tier of Quality Control. We’ve built great relationships with many manufacturers. In the unusual scenario where we receive product on your behalf that doesn’t meet our standards – we’ll make the call immediately, and resolve the situation. We Genuinely Love What We Do!!! There is a reason we have been doing this a long time! Ultimately, it’s all about happy customers!